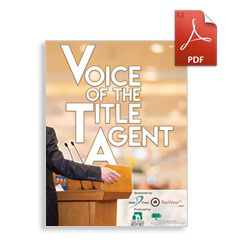 For the 7th consecutive year, The Title Report’s Voice of the Title Agent special report provides critical insight and information on the industry from the people on the ground floor – the title agents. In a year that could’ve gone sideways quickly, title agents reported one of the strongest years in a decade. Thanks to sponsors Data Trace and Adeptive, the 20-page special report is offered as a free download.